This is the first thing I know about you. You are girls. This is still a stunning revelation to a mom of (previously) all boys. Of course I want to say with hindsight’s surety that I knew, but your father heard those hopeful certainties with pregnancies in the past. He will not believe it for one second. When I want to say that I knew, what I mean is that I hoped. I am not ashamed to admit the hoping, because once we found out you were two, the whole world flipped inside out. And I prayed for some piece of the shock and surprise to be a piece of joy I could cling to. I cannot yet bring myself to meditate long on what it might mean to have daughters. Sometimes I catch myself distracted by an adorable toddler in pigtails, or a teenager and her mom talking at the coffee shop, or an older woman walking across the icy parking lot leaning on her daughter’s arm. And I start to wonder what it might be like. But truth be told, I am still holding my breath. Everything still feels so uncertain. This is the second thing I know about you. You are risky. Doctors with serious faces told us this fact from the beginning. Sharing a placenta, I fear, will prove to be much trickier than anything you have to share in the future: toys, clothes, a room, your parents’ divided attention. High-risk are the words wrapped around every conversation, highlighted on our chart, sneaking into the back of my mind whenever I get lulled for long enough to ponder ordinary pregnancy things, like what car seats to buy or where you will sleep or how many diapers you need. Sometimes I get angry or envious of others’ ease when high-risk runs roughshod over yet another decision or dilemma. But then I remember that life itself is high risk. Every icy winter morning I bundle up three small boys and drive them at 70 miles per hour down a winding stretch of interstate to get to school. This is risky. Ten years ago I promised to love one person for the rest of my days. This is risky. Whenever I write, I rip off comfortable layers of self-protection for anonymous readers who may not value vulnerability. This is risky. But all of these realities are also deeply good, despite their risk. So I will not let myself dwell in fear when experts remind me you are risky. I already know many of the best parts of life are like this, too: faith, friendship, creativity, travel, service, education, and love. Especially love. This is the third thing I know about you. You are loved. You have not yet taken your first breaths of air, but you are already cherished and claimed as beloved by more names than I can count. People pray for you and bless you and await you and hold hope for you. Brothers pretend to kiss you or wish you goodnight or thank God for you at meal-time grace. Your father and I do the hard work that love asks behind the scenes: tending, feeding, caring, sacrificing, making tough decisions. I can’t sleep or eat or dress or move or turn through normal routines the way I did before your souls sparked into being, but I know this is love’s way. We are meant to be changed by what we let in. And I long ago decided that while I cannot give you perfect health or perfect safety, I can try to give you perfect love. I work on this every day, so that perfect love will cast out fear. For all of us. This is the fourth thing I know about you. You are doing good. Already you have gathered around you more people of prayer than I can count. Friends, family, strangers, folks we have never met who already take your needs daily before the God who hears us all. You are instruments for change and community and charity before you ever blink eyes open into this bright new world. You teach us about what is essential and what is expendable. You challenge us to let go of false control and lean into deep trust. You invite us to remember life’s precarious, precious, unavoidable unpredictability. You are words in a new story that is being written each day. You are a poem and a prayer. These are true things I know about both of you. Even before I see you face to face. Doctors and experts tell me other facts and figures about you two. Weight and length and weeks and growth and heart rate and blood flow and percentiles and statistics and potential abnormalities and possible risks. These are things about you, but they do not hold the same level of True. They are not lasting. They are not defining. So your father and I, we consider these other things. We ask questions about them. We ponder decisions about them. But we cannot cling to them. They are not you. And if you were anything Other – if you were only one instead of two, or fraternal instead of identical, or further along in pregnancy instead of right where you are today – then you would not be you. You would not be ours. So whenever I am tempted to wish away where we all find ourselves today – idealizing the illusion of a safer, surer Elsewhere – I remind myself that we could be nowhere else. God gave us you, and you show us God. I cling to these truths that are stronger than anything else. We are here together. Thank you for sharing this. Your beautiful words, for your beautiful girls, just cast a smile over my morning. God bless! You are so brave and oh so wise Laura. Love is risky. But God calls us to love and trust in him. Our prayers continue for you and your daughters, your husband and sons. May Our Lady wrap you in her mantle and bring your strength, comfort and peace. Your post brought me to tears this morning. Know we are holding you in our hearts. 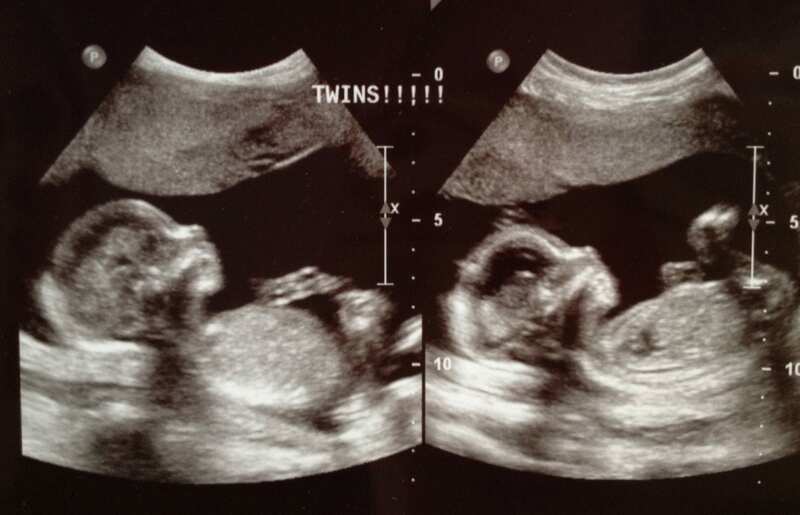 Dear Laura, I commented on your post announcing your twins, and now I’m here to say, “Me too.” My boys are also identical twins, and they were also sharing a placenta, so I have stood right where you’re standing now. Your wise words are beautiful, because your babies are more than a “high risk” label. Your words show that you know this, and you know it probably better than anyone else who is or will be caring for you and your sweet girls. Lean into that precious love you have for them, and lean on God when fear starts to circle. It is so, so hard, but you can do it. I am praying for all three of you, and for your whole family. Such a beautiful letter Laura! Praying for you and the babies! They will have such great big brothers looking out for them. What a blessing! I am so obsessed with your writing, friend. And so joyful over your girls. Love and prayers! Thank you for sharing. You are a strong, faithful women, and you and your girls are in my prayers. God bless! I re-read this today as I wrestle with the news that one of the people closest to me has cancer. I needed these words especially, “while I cannot give you perfect health or perfect safety, I can try to give you perfect love. I work on this every day, so that perfect love will cast out fear. For all of us.” Thank you for blessing others through your writing. Your girls are doing good, and their mother is doing good, too. Holding all of you in prayer.